Souvlaki plural souvlakia are pieces of meat grilled on a skewer aka Greek kebabs. 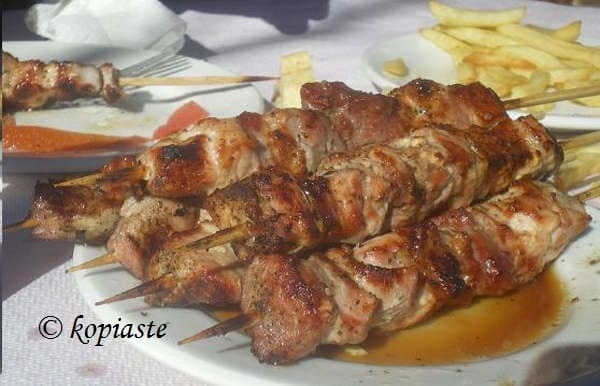 Souvla in Greek means skewer and souvlaki (plural souvlakia) is the diminutive of souvla (little skewer). The pieces of meat skewered and barbequed on skewers are also called souvlakia. You can find street vendors selling souvlaki kalamaki, which is skewered meat with a regular piece of bread. However, souvlaki is also sold in pita with lots of onions, tomatoes or tzatziki. This is not something new. Although some may say that souvaki is similar to the Middle Eastern kebab, we all know that there were Greek colonies all around the Middle East. Among the numerous artefacts found in Akrotiri of Santorini, there were racks clearly intended for grilling skewers of meat over heated coals, proving that souvlaki dates back at least before the 17th century B.C. When we made the lamb souvlakia there was no adequate light, so my pictures are not so good. The marinade makes the meat very tender. Whenever I make some Cypriot Pita, we make souvlakia and sheftalia and serve them with coleslaw, tomato, cucumber, parsley, onion and lemon. In Cyprus, we also add some pickles but I never find them in Greece. Whenever I visit Cyprus, I always bring some along. Instead of serving them the above classic way, one other great salad to use is Tambouli (tabbouleh). You must be wondering what’s a donkey doing in a cooking blog? This cute animal is grazing on Mount Hymettus. Certainly, it has nothing to do with this recipe but this donkey has more sense than most people have. Each summer we have the same problems. Fires! Today, I feel frustrated because this beautiful mountain is once more on fire. Athens is surrounded by mountains and in the East of Athens is Mount Hemettus which is just near my house. Just a couple of kilometres from where the picture was taken is where I live. It’s a very beautiful mountain and we usually go and walk on its trails. The mountain is long, narrow, rocky and arid, with flora that numbers over 600 plants, consisting mostly of several kinds of pine trees and cypresses but there are also olive trees, fig trees, oak trees, carob trees, judas trees, citrus trees, eucalyptus and many other kinds and lots of bushes. No wonder why the Attic honey is considered to be one of the best in the world. It’s full of laurel and rosemary, thyme and oregano and lots of other kinds. On the lower parts of the mountain, its fauna is, donkeys which are used for transportation where cars do not go, stray cats and dogs but the real fauna consists of rabbits, foxes, turtles, hares, porcupines, serpents and of course lots of birds, among them endangered species. I hope to post some beautiful pictures I have taken of its flora in another post. Each year a piece of its forest is burnt. Last year it was on our side of the mountain and this time it’s on the other side. As I am writing this, the mountain is still on fire, as fierce winds sweep it towards our side.As I hear on the T.V., they say that it is a malicious forest fire as they heard some explosions before the fire. The fire reached the peak and now it’s on our side of the mountain and the aeroplanes and helicopters are throwing water. We had power failure because of the fire and you know what that means.No cooking, no ironing, no air condition (the temperature is about 90 degrees, no cold water and no internet). This is really a coincidence as I planned to write about souvlakia which is one of the most popular street foods in Greece. Sia, of Monsoon Spice, is hosting an event called MPB-Street Food, where we have to find a street food blogged by somebody else having a blog and recreate it. Cut the meat into 1-inch cubes. Let them stand in the marinade for about 1 hour and thread on metal skewers. Grill meat over glowing coals, for about 8 to 10 minutes, turning occasionally, until nicely coloured on all sides and cooked through. Alternatively you call grill them for about 20 minutes, turning until done. Remove from the grill and sprinkle with salt, more oregano and lots of lemon juice. Alternatively, you can cook them under a very hot grill, turning constantly, so that the meat becomes well seared on the outside and tender and juicy inside. Nutritional information is for the pork souvlaki. Oh Ivy. I’m so sorry to hear about the fires! These people burning the woods…. I would take them and burn a piece of their body so that they know what they do!!!!! I’m serious about it! I can’t understand why they do it!!!! Ai, your souvlaki looks so good!!! Can I come for dinner? Still on time? thats a lovely recipe dear…Check out my blog for a sweet surprise..
Oh Ivy I hope the fire will stop soon, keep us posted ok? We also had 100 degrees and its a little bit early for such heigh temperature. On the bright side since souvlaki is a perfect excuse for me to eat some more tzatziki, I’m all for it. Nuria, I am waiting for you for dinner. They are probably doing it for profit Nuria. They are burning the forests to build more houses. http://en.wikipedia.org/wiki/Chaat….check this out.hey did u see ur award in my blog?? Hetal, thanks for the information. Have read it and it’s nice to learn new things. Thanks for the award. I have left you a message, didn’t you get it? Hi Nuria, I am waiting for you to come over. Lore, thanks for your concern. It was one of those horrible days today. The aeroplanes were flying until dusk and they informed us on the news that it is under control. Good to know it’s under control. They should jail those who stared it. Lore thanks for checking back. That looks delicious! You be careful over there OK, Ivy? You and your family and neighbors are all in my thoughts! Thanks for these great pics of Athens. And as for the souvlaki, I am smacking my lips (it’s lunchtime here – boy, could I use some souvlaki now!). I’ve been wanting to try souvlaki for a while. Looks wonderful! I’m sorry about the fires. You live in such a beautiful area. Cake and Emiline, wish I could make some for you. Humm… me parece muito bom! obrigado por compartilhar.